Today I’m tackling the contentious subject of submission. Most ladies cringe when the topic of submission comes up, mainly because the 21st century woman believes submission made sense in the 1600s. Back then, the man was the only one bringing the bacon home and therefore, he made all the decisions and she simply followed. The question is, can the modern wife submit to her husband even if she is able top pay the mortgage herself? My answer is a definite YES. Submission is not something you do because…It is something we do because God commands us to. This topic came up when I told my friends I was getting married. Two of my colleagues were quick to tell me how I should not feel the pressure to submit and lose myself in the process. It is important to note that they were both not married at the time, therefore their understanding of what submission is, was based on hearsay. I did not have issues with submission but I don’t think I fully understood the concept. I was in love, about to marry the love of my life and was willing to do anything to make this marriage thing work (even commit to submit). Fast forward almost five years later and I believe I am starting to grasp the concept, I know… I’m a bit slow 😂. Here is what I think; submission does not take anything away instead it empowers you. 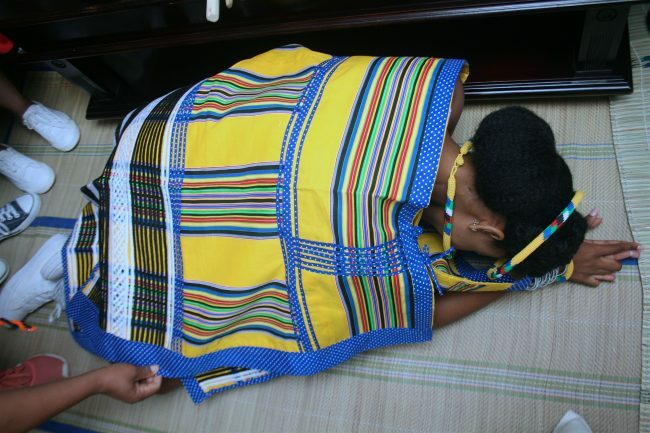 In 2014 I joined a group of married ladies called Mzansi wives, these are married women from different walks of life founded by the beautiful Nomsa Mgomezulu and I am honored to drink from their well of knowledge. One of the ladies by the name of Mpho said “we must be careful not to undermine our husbands decisions because we are one of those decisions”, I’m paraphrasing. In essence, she was reminding us that once upon a time our husbands had to make a decision about having us in their lives, and they chose us, not because they did not have other options, not because there was no opposing voice but they still chose us. Making big decisions can be daunting especially with the pressure of being the “Head” of the family. Your decisions do not just affect you, but the whole family. I can imagine having a wife who is always questioning your decisions and doubting you can be irritating, especially when you know that she once thought the decision to bring her into your life was the best decision ever. And you wonder how she can think that, now that you are married you have suddenly lost all your good decision making abilities lol. That is important to remember when we challenge their decisions, you could very well be questioning your marriage. I know I’m over simplifying it, but hear me out. Once upon a time you trusted his judgment so much that you were willing to give up your last name, just because he made a decision, trusting (submitting)to his directive should not be a problem. I am not saying we should not have an opinion, if you know me you know that I am the mother of opinions about absolutely everything. God brought us into their lives so we can be their helpmates, so I will be the best helper I can be. And that requires that I advise my hubby from time to time and he appreciates my view on things. I don’t always agree with him and the good news is that we don’t have think the same way, we just have to understand each other. I will not go against his wishes if he has made a decision that I do not agree with. I just have to do my part, whatever he decides. I feel the need to explain the part about doing your part, that means you don’t and wait for his way to fail and you then say let’s do it my way. Your part is taking the decision as your own and try your best to make it work to a point whereby, if it doesn’t work you are just as disappointed as he is. Remember you are one when he fails you fail. Let’s take Esther versus Vashti. King Xerxes had a beautiful wife and it really was not going to cost her anything to come when the King called. I know some will say she is not an object etc… but what I see with this specific request, is that it was not about what he asked but how she chose to respond. There will be many occasions where you will have to choose how you respond to your husband. Don’t be easily provoked, sensitive and just extra for no reason. Choose not to take offence, always respond with love and remember he means you no harm. Esther, on the other hand understood that the King had made a decree and people were going to die. This is what separates the two women, One knows which battles to fight and the other one doesn’t. And of course the approach, she asked God for favor with her husband. Just like Esther you can get your husband to say “What is your request, ask even if it’s half the kingdom you will get” there is power in submission. When you are not petty and don’t complain about everything, when you have an important matter to bring to your husband he will be more than happy to hold up the scepter for you to enter where others are forbidden. “Sarah called Abraham “My Lord” , in my book that is the highest level of honour to call your husband but bear in mind, it is not just a name; it has weight. We bow in reference to God when we come before Him. We bow in the presence of a king. So how much more should one bow before him whom you carry his name? The power of submission lies with the giver, you have to be a strong person to be able to relinquish your desire for another’s, and for the benefit of all. One day when I was cross with Sweet-One (yes we do fight) I really didn’t feel like serving him, talking to him, never mind submitting. The Holy spirit simply said “submission is not a reward for good behavior”. That goes against the narrative that most people preach which says – he must love me first and then my submission will be a response to his love. Yes, the word does say husband love your wife and wife submit to your own husband. But, there is nowhere is the bible where it says submit only when he loves you or when he says or does what you like. Don’t get me wrong, husbands should love their wives and it is easier to submit to someone who loves you but that darling is not a prerequisite, even on days you don’t particularly like him you still have to submit. One day when you give your account, God won’t ask you what did he do?but he will ask you if you did what you were supposed to do. Let your husband answer to God, you can’t disobey him into loving you. Please do let me know if you think submission is still relevant. Wow, as a wife your service is first to your husband not God. I am not married yet but I am so inspired to submit and I am equipping myself day in day out on this subject. I believe this is also the back-bone of our marriages. Someone once said women don’t realise how much power they have in their marriages. Your husband is the head and you are the neck that turns the head. Women arise!!! So so true , when I wrote this i knew i would not be popular with the ” woke” generation ,and you are right its worldly standards. I’m single and subscribe to the topic and its relevancy. I think when you submit in wisdom. It just makes your life easier on a range of things.”not a reward of good behaviour” that’s the Holy Spirit for you. It will teach all things. Thanks for this Prue.